The scientists, engineers, astronauts and other professionals in the early years of the space program were just as geeky as today’s Star Wars and Star Trek fans. 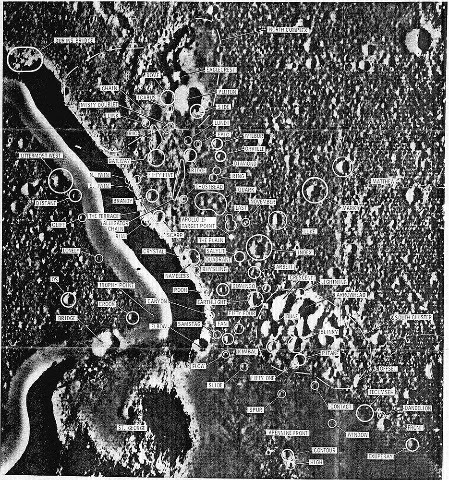 You can see this inherent geekdom demonstrated by the naming of the craters, mountains, rilles and other features on the lunar surface. The Apollo 15 site is a perfect example. In July 1971, astronauts David R. Scott and James B. Irwin spent a significant amount of time looking for the Rhysling crater, which is named after the blind poet in Robert Heinlein’s The Green Hills of Earth. Unfortunately, there are no road signs on the moon (nor roads) and the topography looks much different when you’re roving around on it than it does when you’re looking at it from above. They actually stopped near the crater to take a sample, but weren’t aware at the time that the particular crater they were passing was Rhysling. Google Moon is an excellent tool for exploring the Apollo landing sites. You can see the paths the lunar rover took on three EVAs (extra vehicular activity, meaning they were wearing spacesuits out on the surface) as well as many points of interest along the way. East of Rhysling is Earthlight, named for the novel of that name by Arthur C. Clarke. Earthlight is set on the moon, about 200 years after the first landings. It was first published in 1975, shortly after the Apollo missions. South of Earthlight is Dune, named after the far-future novel by Frank Herbert. There are also craters named for Winnie the Pooh, and Saint George of dragon-battling fame. Google Moon doesn’t show the names of all the features. There are simply too many! But this image from NASA shows many more. My favorite is Durin’s Bridge, which you see in the upper left corner of the image. It is an actual bridge across Hadley Rille, which is the black river-like feature. Sir Ian McKellen gave an excellent performance in the 2001 movie The Lord of the Rings: The Fellowship of the Ring. Durin’s Bridge on the Moon is not about to collapse under the weight of a balrog. It’s a solid mass that spans the rille. If water flowed through that valley, it would be Durin’s Dam. Once upon a time, it was formed by a volcanic basalt flow moving across the lunar surface. I’ve no idea what formed the bridge itself. With several robots visiting the moon in the past few years, we have better images than we did before, but a postcard with Durin’s Bridge in the background is a few decades off yet. The latest short story in her SciFi series The Cities of Luna comes out tomorrow, Saturday, December 6th.